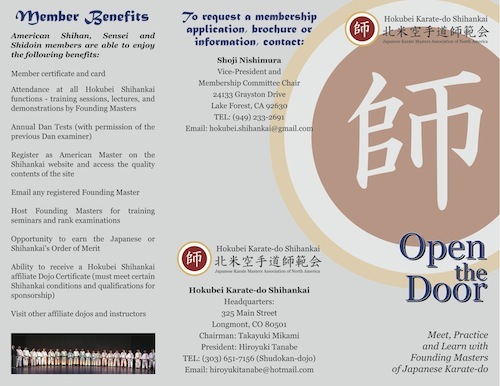 Hokubei Karate-do Shihankai (Japanese Karate Masters Association of North America), simply called as Hokubei Shihankai, a not for profit organization (501c3), registered in Longmont, CO, now opens its membership horizon to American black belts who are expected to carry on the legacy of Founding Masters. Most of the pioneering Karate Shihans came to the USA in the sixties and the seventies. The dedication, energy and hope kept their torches of these Shihans bright and strong, in the new land and under a new and difficult environment, to introduce Karate-Do in North America in a true form of a traditional Japanese martial art, both technically and philosophically. Degree of difficulty they faced was something like climbing a mountain to reach its peak for the first time. 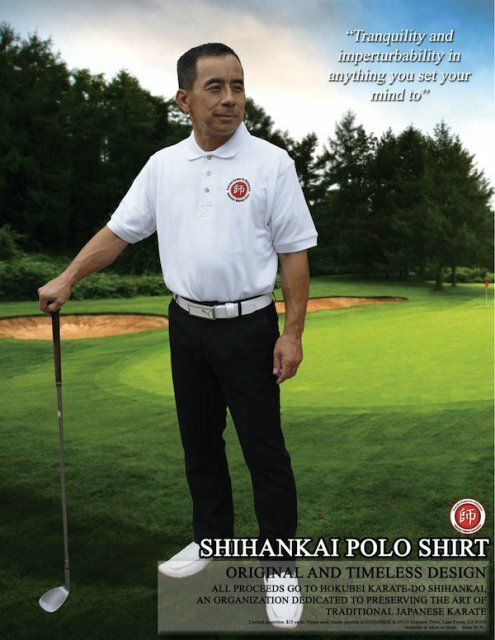 How often they felt they might just as well giving the efforts up to transmit the culture of this traditional Japanese Budo to the people of different values and culture with the mind set of "the shortest possible way is the best way to the goal." After nearly a half century, we celebrate proudly of our accomplishments to have transmitted the very principle of this historical importance as "Karate" now became a house hold word in the USA. Regretfully some of the meaning of this art was misinterpreted and ill-used for some commercial profit seekers. We now tolerate even that wrong paths in the spirit of Karate-do's principle of seeking an internal peace that differs from people to people. We, Hokubei Shihankai's Shihans, feel how blessed we were to have given the opportunity to introduce the very essence of the art to many enthusiasts and students of the foreign land. Hokubei Shihankai now opens its door to anybody who respect the value and share the importance of keeping the torch of the art to future generations by American Karate enthusiasts who, we know, have been practicing on an average 25 yeaers under such pioneering Shihans. Hokubei Shihanksi is based on a principle of non Ryuha (style) non Kyokai (association)-major or minor-and do accept any black belts. We refrain from any criticisms of each other, rather attempt to focus on the benefits and gains of the attained techniques, thoughts, beliefs, spirits and attitudes that we can share in Karate-Do. In another word, Hokubei Shihankai embrace anybody regardless of practice history, styles, associations. That is the core philosophy of this organization-We are above differences and on the same level field of considering Karate as Budo. As in the case of the founding pioneers in Okinawa, before the art was found by the mainland Japan, we believe in learning from any dedicated Karate-ka and from each style and association through practice and meeting to exchange thoughts and enlightenment in the art. Our purpose is to polish our character through pursuit of the arｔ, develop camaraderie among the black belts, and to win over self, not others in becoming a good human. There are three categories in the ranks of American Masters. They are Shihan (for current 6 dan to 8 dan black belts); Sensei (for current 4 dan to 5 dan black belts); and Shidoin (Sho dan to 3 dan black belts). When joining Hokubei Shihankai the current rank of the applicant are accepted due to our respect of their ranks regardless of how they were ranked. Register as American Master on the Shihankai website and access to the quality contents of the site. *Dan tests are conducted annually for any style and association, and costs of registration and certification are additional and separate. Click either image to download as a printable PDF file.